What is your favourite city? Decorating your walls with a map of your hometown or favourite destination has become extremely popular! We stock posters of city names and maps. We also have world maps in black, gold and silver. 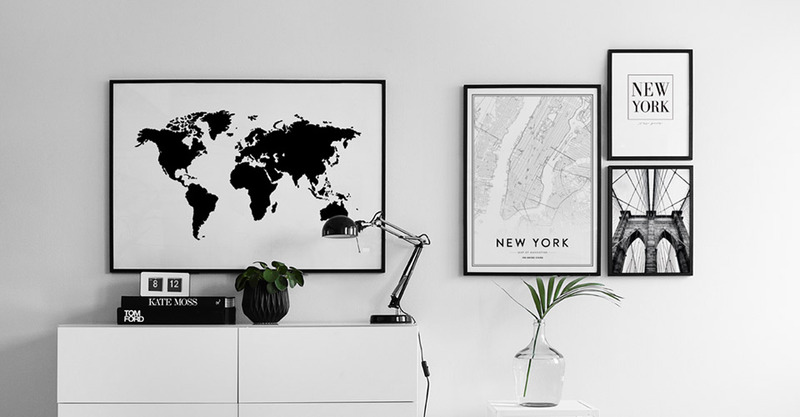 Posters and prints with world maps, maps of cities and landmarks are always nice to have on the wall. Decorate your walls with your favourite cities, or dream destinations. Here you will find posters with maps of New York, Paris, Stockholm, London, Barcelona and many other cities. We also have several stylish variants of world maps. We also have fine, old black and white photos of London and Big Ben. Stylish urban prints are perfect for combining with a text print. We print on uncoated, high-quality paper with a matte finish. Frames are not included, but can be purchased separately. Our most poular worldmap is the one printed in gold.